It's hard to believe, but two weeks from today I head to Hollywood and the annual Movie Wonderland which is the TCM Classic Film Festival! This is the festival's 10th year, and TCM will be celebrating its silver anniversary date on the final day of the fest. This year's festival theme is "Follow Your Heart: Love at the Movies," which seems especially appropriate as we celebrate these special anniversaries. Classic film fans will be immersed in watching movies from Thursday night, April 11th, through Sunday evening, April 14th. I typically see 16 or 17 films in a little over 36 hours, and it's possible I'll exceed that number this year! 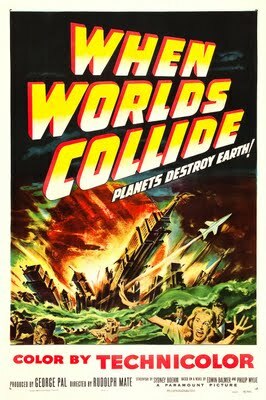 As usual, I'll also be spending time socializing with my fellow classic film fans before the movies start rolling. The annual reunion with so many friends from across the U.S. and beyond is my favorite part of the festival. Once again I'm delighted to be covering the festival as a member of the credentialed media, my seventh year in that role and my eighth year to attend the festival. (In 2012 I was there briefly thanks to the standby line.) I look forward to bringing all of you complete, in-depth coverage. During the festival please follow me on Twitter for live coverage, including many photos and schedule updates, and then check back after the festival for a series of detailed daily recaps and film reviews. There is a major venue change this year, with the removal of the smallest of the three theaters used at the Chinese Multiplex and the addition of the American Legion Post 43 Theater on Highland Avenue. Theater 4 at the Multiplex only seated 177, and as I mentioned in my 2018 overview, "sellouts" were an issue there again last year. The Legion Post 43 Theater seats roughly 2.75 times that amount, with 484 seats, so that aspect is fantastic, enabling more people to get into what they want to see, although I'm a bit concerned about how the hike up Highland will impact getting from movie to movie. It's a mile round-trip from the Chinese Multiplex at Hollywood & Highland to the Legion Post 43 Theater and back, compared to under half a mile making the same round-trip trek from H&H to the Egyptian, and as I recall it's a bit of a steep walk. I find that despite all the time sitting at the festival, I usually walk close to 20 miles during the fest, and this year that total will doubtless be higher! For those who missed the link I shared in my January roundup, here's an article on the remodeled Legion Post 43 Theater, and there are more photos at the theater's website. I've finally completed a rough outline of my festival schedule. I take many factors into consideration when choosing: How much I like films I've seen, how recently I've seen them, whether a film is a first-time viewing, the format -- whenever possible I prefer "real" film which is only possible to see in a theater -- and logistical issues, such as how a film's running time and location will impact my ability to see the next film in line on my schedule. I also try to schedule one post-breakfast meal break; I'm not sure I've ever been able to eat more than one meal after breakfast at TCMFF, subsisting the rest of the day on packed snacks and Auntie Anne's Pretzels. This year meals on Saturday and Sunday may be non-existent if I get into everything on my list! I tend to stick pretty closely to my original schedule, but unplanned last-minute changes are sometimes the best experiences, and this year it seems as though there are more options tugging at me than ever! Here's a look at my initial outline for this year's festival. Click any hyperlinked title for my past review. 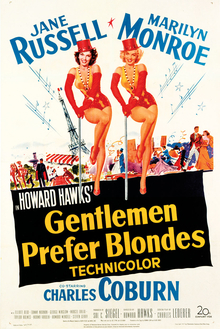 The first pick of the festival is an easy one for me: Jane Russell and Marilyn Monroe in GENTLEMEN PREFER BLONDES (1953) in a digital print at the Egyptian Theatre. I'm not sure I've seen it since I was a teenager and saw it at the Los Angeles County Museum of Art's Leo S. Bing Theater. That will get the festival off to a lighthearted start! I'm kind of hoping that the pre-Code NIGHT WORLD (1932) playing opposite it will show up in one of the five "TBA" slots reserved for second showings of popular films on Sunday. I plan to stay at the Eygptian for a nitrate 35mm print of THE BACHELOR AND THE BOBBY-SOXER (1947), another film I last saw in a theater at LACMA. I've seen it many times over the years but I love any chance to see a nitrate print and you can't miss with Cary Grant and Myrna Loy! That said, I could be persuaded to change my mind and head to the Chinese Multiplex for the chance to see the gorgeous THE UMBRELLAS OF CHERBOURG (1964) on a big screen in a digital print, and I also sure wouldn't mind seeing a 35mm nitrate print of MOGAMBO (1953), introduced by Illeana Douglas. Part of my calculation here is that the nitrate print might be the least likely to screen again locally; I suspect UMBRELLAS, at least, will turn up somewhere in the future. Interesting choices to start the day! I think I'm going to forgo Fredric March and Sylvia Sidney in the pre-Code MERRILY WE GO TO HELL (1932), showing digitally, and a 35mm print of the Judy Garland-Robert Walker WWII romance THE CLOCK (1945) in favor of a digital print of HIGH SOCIETY (1956), shown at the Legion Post 43 Theater. I haven't seen that one in a theater since the Tiffany Theater in the late '70s, and I do love my MGM musicals! The chance to see Bing and Frank on a big screen is very appealing. 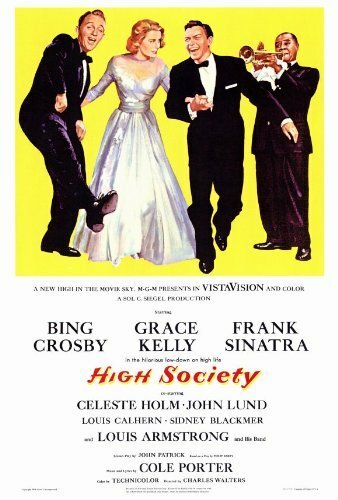 Some like to diss this film as inferior to the original THE PHILADELPHIA STORY (1940), which I saw at the festival in 2015, but I find HIGH SOCIETY quite a worthy film in its own right. Choosing it as the first screening of the day would also be an easier time to make my first trek to the Legion Post 43 Theater. In the second slot I think I'll stay put at the Legion Post 43 Theater for the presentation "What's Not to Love About Republic Serials?" with Andrea Kalas of the Paramount Pictures Archives. I've just begun watching some serials over the last couple years, and I think it would be an interesting and educational 90 minutes. From the description: "This clip show from the Paramount Archives' recent preservation work focuses on the amazing work done by stunt men and women, special effects wizards and the amazingly innovative re-use of costumes, props and full sequences from other movies." Having said that, my arm wouldn't have to be twisted hard to convince me to head to the Egyptian and SLEEPING BEAUTY (1959) with Disney animator Floyd Norman present, but since I just saw SLEEPING BEAUTY on a big screen in late January and I've been privileged to see Norman at a D23 Expo, I'm leaning toward the more unique presentation, especially as I'll already be in place at that theater. The third screening of the day is one of my toughest decisions. I've seen RAIDERS OF THE LOST ARK (1981) many times, the first time being a very memorable sold-out sneak preview the week before it first opened, but seeing it in the big Chinese Theatre with one of the fabulous special effects presentations by Ben Burtt and Craig Barron would be incredibly fun. And I've been wanting to see the beautiful SUNRISE (1927) in a theater! 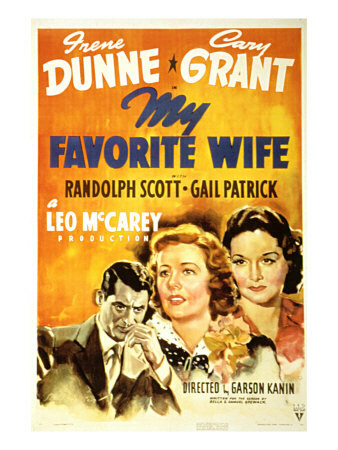 But I think I'm going to skip those digital presentations in favor of a 35mm print of a favorite Cary Grant-Irene Dunne comedy, MY FAVORITE WIFE (1940), at the Egyptian, introduced by Cary Grant's daughter Jennifer. (Incidentally, that's another one I saw at LACMA as a kid -- twice! I was so fortunate to see so many great movies there growing up.) The choice of MY FAVORITE WIFE also gives me enough time to fit in a dinner break. Slot four on Friday is perhaps the one about which I'm most uncertain. I'm skipping a 70mm print of my beloved THE SOUND OF MUSIC (1965) at the Legion Theater because I saw it in 70mm at the Egyptian in 2012 and also because I just saw a digital print on a big screen last September. I'm also trying to minimize trips up the hill to that theater! I will probably pick the Charles Bickford pre-Code VANITY STREET (1932) in 35mm at the Chinese Multiplex, but it's possible I'll throw caution to the winds and try a real change of pace for me, Clint Eastwood in a world premiere 40th Anniversary restoration of ESCAPE FROM ALCATRAZ (1979) at the Egyptian. If I see VANITY STREET it's short enough I could also revisit OPEN SECRET (1948), shown in 35mm in the same theater, which I first enjoyed at the 2017 UCLA Festival of Preservation. I think most of my friends will be heading to the nitrate print of the terrific ROAD HOUSE (1948) for the late evening showing, but I was able to see that same print at UCLA just two years ago. 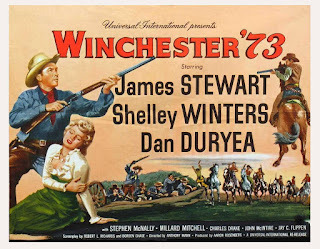 It actually makes me happy that I'm not feeling the pull to see that one, because one of the films I want to see most at TCMFF is WINCHESTER '73 (1950). 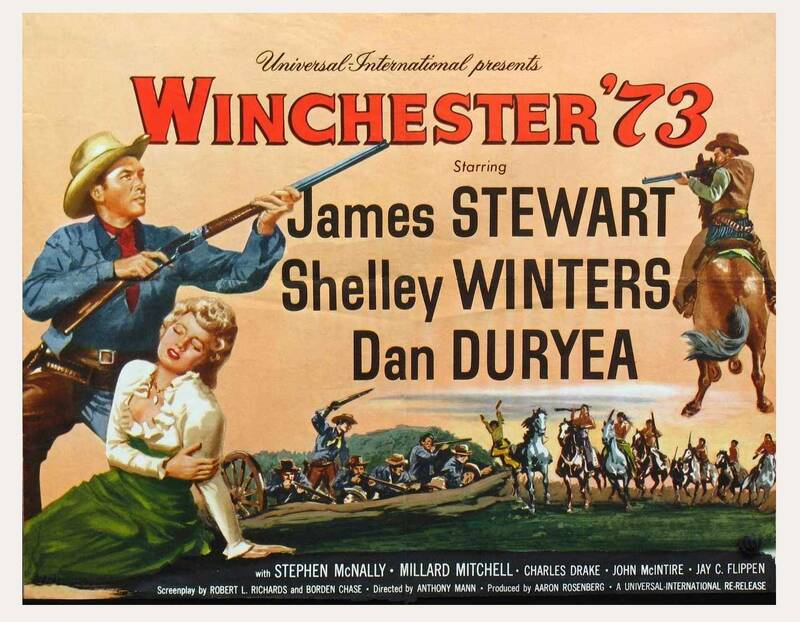 I saw WINCHESTER '73 in 35mm at UCLA five years ago, but I adored it and am more than ready to see it again on a big screen. It's a digital restoration introduced by Jeremy Arnold, who introduced two Westerns I saw at the Autry earlier this year. For those who may wonder, it's my firm policy to never, ever attend the midnight showings on Friday and Saturday nights at the festival. I envy the fun my movie pals have at those late-night screenings, but if I did it I simply wouldn't stay awake the following day during movies I'm more invested in seeing. My festival roommate KC goes to the midnight shows, and I love hearing her stories about the screenings. I do regret missing Herbert Marshall wielding a flame thrower in GOG (1954) a few years ago! 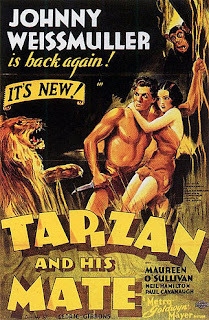 The pre-Code TARZAN AND HIS MATE (1934) is showing in 35mm in Time Slot #2 on Saturday, and this is one of the films I most want to see. I haven't seen it in many years and have never seen it on a big screen...and even better, it will have one of the terrific intros by Craig Barron and Ben Burtt. I anticipate learning all sorts of interesting things about censored footage and how those scenes were later restored. This film is showing in the smallest Multiplex theater, which seats 210, and I anticipate it will be a packed crowd. The third slot on Saturday is a tough one. One of the Multiplex theaters will be showing FATHER GOOSE (1964), with Leonard Maltin and Susan King hosting three of the film's former child actresses; I did just see that on Blu-ray last year so it's a bit less of a pull for me, though I always enjoy it and I suspect some of the scenes with Cary Grant talking to Trevor Howard would be hilarious with a crowd! It's up against Dana Delany introducing a 35mm print of LOVE AFFAIR (1939) in the other Multiplex theater or a Tom Mix double bill consisting of THE GREAT K AND A TRAIN ROBBERY (1926) and OUTLAWS OF RED RIVER (1927) at the Legion Theater, shown in 35mm and digital, respectively. The film I want to see in the following slot, BLOOD MONEY (1933), is a pre-Code hosted by Bruce Goldstein of the Film Forum, and it's sure to be a hot ticket in the smallest Multiplex theater; I've never seen LOVE AFFAIR, which would leave me best positioned to get into BLOOD MONEY, so LOVE AFFAIR is the most likely option here. But if I decide I need to eat dinner, I may instead head up to the Legion Theater for the Tom Mix films and follow that with a meal. I really liked Mix's film JUST TONY (1922) at last fall's Lone Pine Film Festival. You can't go wrong no matter what you choose! Fortunately I find that after the festival I tend to remember the great things I saw more than regretting what I missed. As mentioned, Slot #4 will either be BLOOD MONEY (1933), starring favorite Frances Dee and shown in 35mm, or dinner! 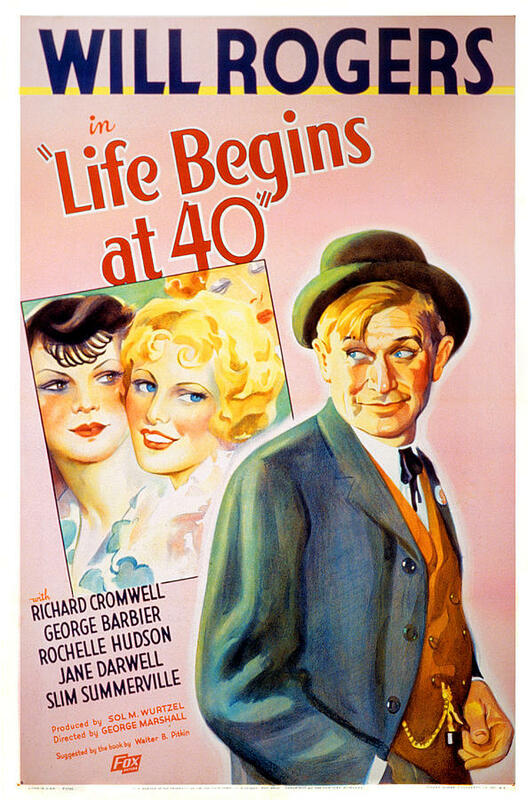 Next up is another film I especially want to see, Will Rogers in LIFE BEGINS AT 40 (1935), showing at the Multiplex in 35mm with an introduction by Leonard Maltin. 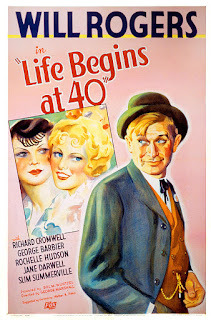 I've really enjoyed Rogers in TOO BUSY TO WORK (1932), JUDGE PRIEST (1934), and STEAMBOAT ROUND THE BEND (1935), and this is a rare opportunity to see him on a big screen. There seems to be a Cary Grant theme at this year's festival! 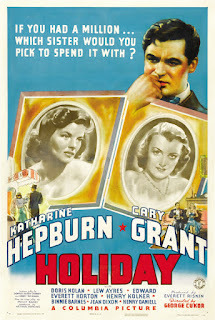 Barring a desirable TBA film like NIGHT WORLD (1932) or BLOOD MONEY (1933), I'll be seeing a digital print of HOLIDAY (1938) at the Multiplex first thing Sunday. I'm not super-enthused, as I've seen it twice previously on a big screen, but it's a good film and I do sometimes find that the movies I'm not excited about end up being really special when seen at the festival -- case in point, last year's Sunday morning screening of A MIDSUMMER NIGHT'S DREAM (1935). And the first TBA film of the day will be up the hill at the Legion Theater, so in the end HOLIDAY probably leaves me best positioned for the next film, which I really want to see. Next up, MAGNIFICENT OBSESSION (1954), showing digitally at the Chinese Multiplex; it's one of my "must see" films this year, along with WINCHESTER '73, TARZAN AND HIS MATE, LIFE BEGINS AT 40, and THE DOLLY SISTERS. I haven't seen it since it was on TV when I was a kid, despite owning the Criterion Collection DVD. (So many movies, so little time...!) I've seen three other Sirk films at past festivals, WRITTEN ON THE WIND (1956), IMITATION OF LIFE (1959), and ALL THAT HEAVEN ALLOWS (1955), so it would be great to add another Sirk title to the list. In the same time slot it would also be quite fun to see YOURS, MINE AND OURS (1968) with Leonard Maltin interviewing some of the children from the film, including Tracy Nelson. It may not be a great film, but it's one I go back to every few years, and I'd love to hear the kids discuss it in the Legion Post 43 Theater. As I've said, you really can't go wrong with the choices at this fest! 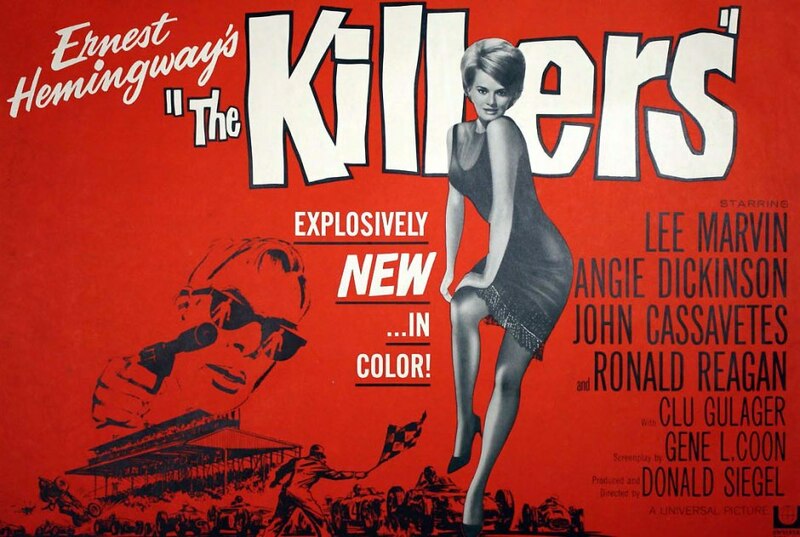 Next up will be my first time to ever see THE KILLERS (1964), which will be introduced by Angie Dickinson (!) and shown digitally at the Chinese Multiplex. 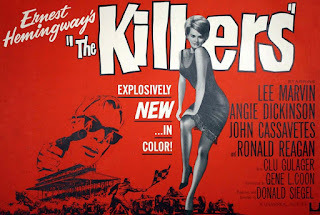 THE KILLERS also stars Lee Marvin and Ronald Reagan. I wonder if co-star Clu Gulagher, a familiar front row face at so many screenings in L.A. and Palm Springs, will be there? Note: Though I'm pretty sold on this title due to the presence of Angie Dickinson, there are also two TBA films in this time slot. THE KILLERS gets out an hour before a 35mm print of Greta Garbo in A WOMAN OF AFFAIRS (1928) starts at the Egyptian, and that theater is big enough, seating over 600, that I could probably get in despite THE KILLERS being one of the last films to let out in the previous time slot. I'd been thinking I'd use this time to eat dinner, but the more I think about Leonard Maltin and Kevin Brownlow introducing the film, and a live orchestra playing a score composed and conducted by Carl Davis...What a special opportunity, and I also wouldn't have seen a silent film at the festival up to this point. Let's just say that by Monday I'm probably going to be VERY hungry. 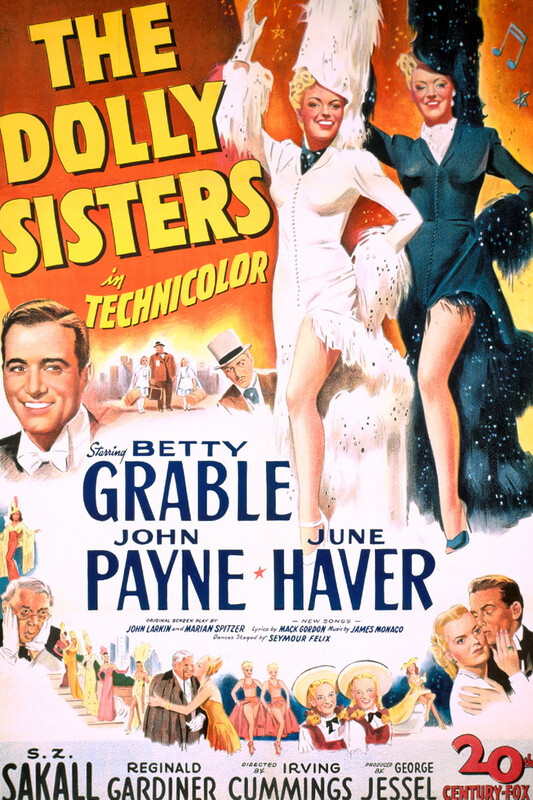 After that my final choice of the festival is unquestionably the 35mm nitrate print of Betty Grable, June Haver, and John Payne in THE DOLLY SISTERS (1945) at the Egyptian. Fox Technicolor in nitrate! Enough said. Last year 14 of the 17 films I saw at TCMFF were 35mm prints. This year the 35mm total will be lower, but the number should still be well over half, depending on my final choices. I saw 11 movies at the 2013 festival, 14 in 2014, 16 films in 2015, 15 in 2016, and 17 (including a slate of cartoons) at the 2017 festival and again in 2018. This year it could possibly be as many as 19, including the Republic serials presentation, but it may be turn out closer to my total for the last two years if eating beats out a couple of my choices! Anyone who's posted a schedule not listed here is most welcome to share the link in the comments! For a look back in time, my post on last year's schedule is here. Please also visit my posts on past festival schedules, listed in reverse chronological order: 2017, 2016, 2015, 2014, and 2013. Previous TCMFF 2019 Posts: TCM Announces 2019 Festival Dates and Theme, TCM Classic Film Festival Announcements, Latest TCM Classic Film Festival Announcements, New TCM Classic Film Festival Announcements. Update: The 2019 TCM Classic Film Festival in Review. Laura, again I envy you in being able to attend the TCMCFF. I so enjoy your coverage of the movies and events. So, thank you for taking the time to make it enjoyable for this reader. 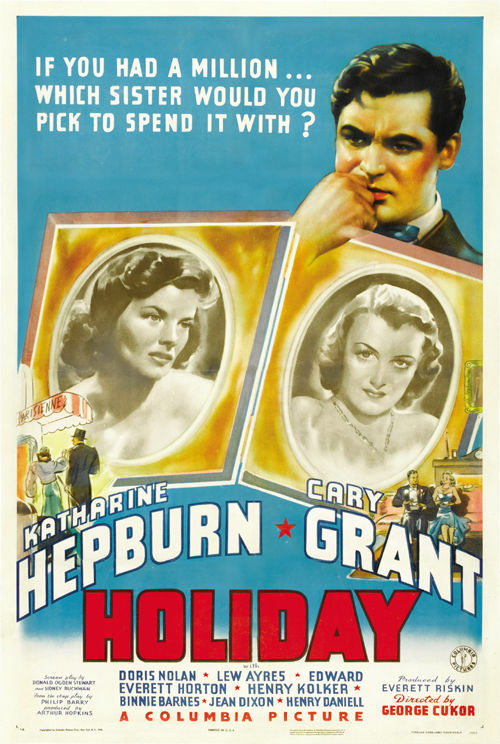 My Favorite Wife and Gentlemen Prefer Blondes make my top two, but with a little more 'tumbling' Holiday would be right there. I won't be going to TCMFF this year, but I am looking forward to the coverage of it from my blogger friends! Looking at the schedule I think Thursday night has the most conflicts for me. I want to see nearly every film they have scheduled! Friday afternoon looks like it would be the only slow period for me if I were going. Anyway, I hope you have fun! Sounds like tons of fun. Just to pick a few: I love Night World, Blood Money and Escape from Alcatraz... what are the chances of a surprise appearance by Clint to intro that? Among many other picks, I'd be at Winchester '73, and one you didn't mention, Escape from New York, with John Carpenter there. Very interested to see how the Legion screenings work out, maybe they should arrange for a shuttle. Looking forward to all the coverage, have a great time! Well, I'm no classic film blogger--I'm barely even a blogger--but I've posted my schedule, such as it is. It looks like we're of the same mind on a few things. I'm excited for the chance to meet up with you again, and to meet other film fans. Surfacing after a couple hectic weeks of work and "festival-ing" to let you know how much I appreciate all your thoughts! And Seth, thanks for sharing your link! If you spot me before I spot you please be sure to say hi! Wish all of you who can't come this year could be there in the future!